included in the Aug Club Q Monthly Kit. 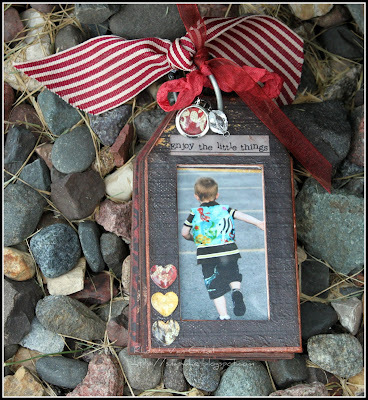 Have you seen the tag set that came in our August Club Q kits? Can you say adorable! The moment I saw it I knew I wanted to make it into a mini-album! To add pages, it’s very easy, just trace the back shape onto some plain chipboard or you can use a cereal box. I found the perfect sentiment in my Itty Bitty Vellum Quotes “Sentiments” and attached it from behind. The idea behind the mini… just everyday moments that we might not otherwise capture. The unexpected surprise of the new Cherry Truffle line is the bright pop of gingham yellow paper! It makes the very elegant papers really sing and worked wonderfully with my photos here. Trace shape of back solid tag shape to create additional pages using chipboard. Inked edges of pages before adhering papers. For the cover, after covering with paper, I used a coat of Modge Podge in matte finish and it created a finish that combined with the brown paper, takes on a leather like texture and appearance. Rub-on embellishments were used to avoid adding a lot of bulk. I used some of the scallop trim for a bit of accent at the top and the swirls from the kit under a sentiment block for fun. The added kit elements are fabulous! This is a photo I took in Hawaii on our road trip from the North Shore back to our Hotel in Oahu. The views were AMAZING and my husband was nice enough to make multiple stops so I could enjoy the view and take pictures. This page was completed in less than thirty minutes (which sometimes is VERY nice). I used elements from the August Club Q and the only additional product used on this page was a Bloody Mary Powder Puff Ink Pad. Tips: The Large Gingham photo mat was a laser cut included in the kit and I kept the negative and removed the two flowers from the top and replaced them with the photo. I then took the die cut flower from the bottom of the die cut and just flipped it over. I made the frame for the vellum quote from scalloped die cuts included in the kit. PS - our first official FRIDAY challenge was posted on 8/5! You can still join in on the fun & win a great prize!!! 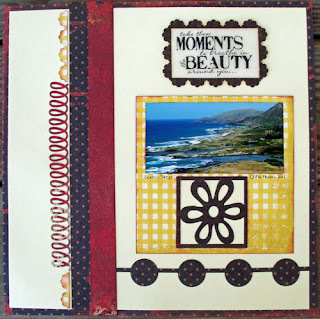 Link up your project by Thurs 8/11 at 11:59 pm (pacific). Wow. These are great tips. I always think that DIY stuff is really creative and can even look more beautiful compared to the ones that you buy on malls.